Yoshitaka Amano has an impressive resume that's a lot more than just Final Fantasy. Before joining Square Enix, he designed characters for a slew of classic anime, such as Gatchaman. And since stepping down as lead character creator after Final Fantasy VI, Amano has teamed up with a variety of folks, including Neil Gaiman. But that's not what I want to talk about today. I want to talk about vegetables. Vegetable fairies, to be exact. My four year-old son has recently discovered a series Yoshitaka Amano created for NHK called Yasai no Yousei: N.Y. Salad (やさいのようせい N.Y. Salad) or "Vegetable Fairies: New York". The series debuted way back in 2007, before he was born. For some reason, it completely slipped under my radar, popping back on it when the Japanese site Naver recently featured the cartoon. Each episode was only five minutes long, and it was broadcasted during the kiddy programming NHK runs each morning. 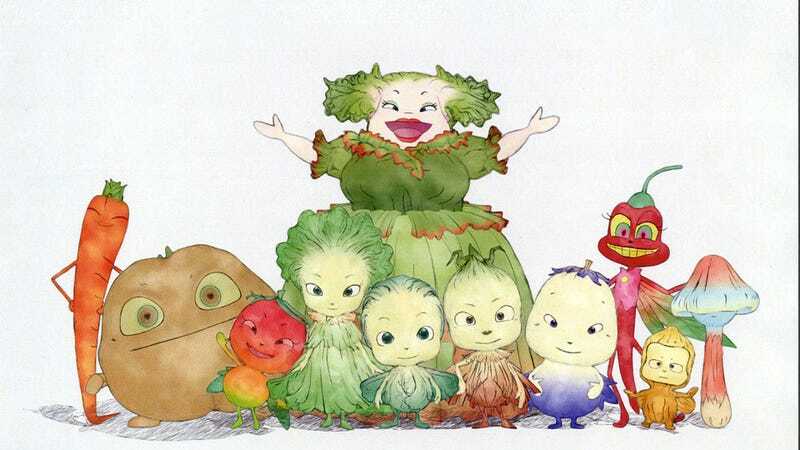 Yasai no Yousei was set in a New York City kitchen, and followed a handful of vegetable fairies, like Brussel Sprouts, Garlic, Lettuce, etc. The show has a wonderful fairy tale-like atmosphere, and Amano is in top form. He truly is one of the giants of Japanese art. Often, fine art is separated from video game or manga art and is given more credence in some circles—a huge oversight, I think. Amano is a giant, and discovering Yasai no Yousei helped me rediscover how much I enjoy Amano's art. Yasai no Yousei has been in rebroadcast on Kids Station. Besides a handful of children's books, there are several Japanese language DVDs of the show as well as a movie. Delightful stuff that belongs up there with some of Amano's most famous work. Be sure to check out Kotaku's interview with the artist from last fall.